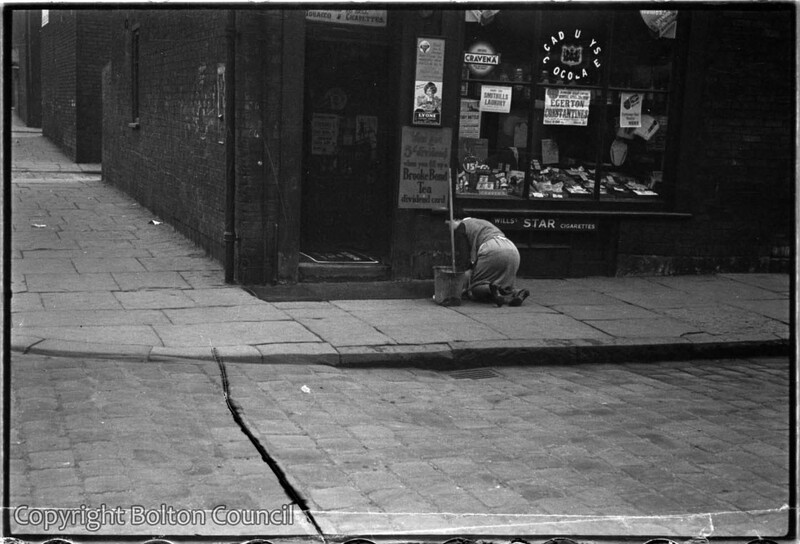 A woman cleans the pavement outside a corner shop on Orm Street, just off Thomas Holden Street in Bolton. The street no longer exists as the area was cleared and new homes built in the early 1980s. Humphrey Spender returned to Bolton to record the demolition of Davenport Street and the surrounding area for the documentary film Return Journey. i am 62 now and live in Brisbane Australia, I used to live in this street and go to the primary school behind (cant remember name) went to Whitecroft Rd High School – believe its not there anymore. AND I used to have a partime job in this shop stacking the shelves on a Friday night. Anybody remember Freddie? My stepmother used to work in the mill at the end of the street. OH and does anybody remember that fabulous pie shop in the middle of Orm St, think a big family lived next door I was friends with Christine. The name of the school was Gaskell st.All my family attended. My mother told me that when she went,.TWIGGIES dad went there. My mothers teacher was Miss Lomax.She was still there when i and my brothers attended. A very large lady who was very nice. I can, remember a shop in the middle of Orm st. There was one at the other end opposite the stables. We used to go in and get a glass of Stantons sarsaparilla for a penny. Hi Silvia Brian here I lived in orm st with my granny and granddad for about 12 month and went to Gaskell st school while I was living there and yes there was a shop about half way down can’t remember name of the shop remember the tippler toilet at the bottom of the yard . I meant to say I dont remember any shop in the middle of Orm ST. It is possible one was opened later. I have just discovered after gaining a copy of their marriage certificate, that my paternal grandparents lived on Snowden Street and Orm Street. My parents owned the shop mentioned by Norman King at the other end of Orm Street from around 1946 to 1956 – it was no. 1A! The stables with horse trough opposite were owned by the Moss family and at 1B lived Mr. Jones – the bookie, at 1C the Robinsons with Alan and Anne plus two other kids, then, I think, the Hewarts at No. 3 (see Sylvia above) and then the Crooks (Wendy was one daughter) at No. 5 with Susan Horrocks opposite. Midway down on the same side as Susan lived Freddy Ramage(?). In the shop we sold more or less everything imcluding penny lollies made with Ribena(?) I was born in Snowden Street before moving to Orm Street and went to Gaskell Street school. Most fine or drizzly days we played football or cricket in Orm Street. It was tarmacked and flat. Lots of skipping and hopscotch as well. One day a lorry with cotton bales ran down the hill from the entrance to Baileys Mill opposite Snowden St. and crashed into out shop – the photo was in the Bolton Evening News but I can’t find it in their archives. Any one have a copy? My grand parents lived in orm st, Walter and Beatie Hewart. Gordon Hewart was my dad, and I use to visit my grand parents on Orm Street. My father often spoke of Arthur Moss, and when Arthur returned from the war he had a street party. Many fond memories of Orm street. Hi just thought I’d tell you it was my grand parents the Hewarts at number 3 I always thought it was number 1i lived with my grand parents for about 12months in the early 50s and went to Gaskell St school while I was living there my dads still alive and lived in Orm St then moved to Vermont St till they pulled it down and he moved to Langdon Close which is just round the corner from were Orm St used to be so did’t move very far all his life he’s 92 this year. Hi Brian, do you remember me, I’m Gordons daughter? Do you remember our grandma cutting up newspaper into squares and hung it at the back of the toilet door. Do you remember her gas ring in the kitchen, as she never had a cooker?? How is your Dad, Uncle Clifford?? Hi Sylvia of course i remember you and yes i remember the toilet at the bottom of the yard i had to stand in there with my granny because i was very young and she could not leave me on my own while she went to the loo,and i remember the gas ring it must have been such a hard life don’t you think.I always thought my granddad was a gangster with his long raincoat and trilby what i remember of him i think you’re dad looked like him more than my dad.my dad is still with us he is in farnworth care home now, he’s ok just bit of memory loss but he’s 91 now 92 in November so not doing to bad.So how are you and what are you doing now do you hear from Lynn hope i spelt her name right shame we all lost touch but that’s life hope to hear from you soon take care. Lovely to hear from all the people who lived in Orm st. My grandad Harwood who had a fruit shop at the top house in Davenport St. used to stable his pony at Moss’s at the end of Orm St.We lived at no 23 Orm St.
My grandfather, John James Stanley (1895-1973) lived at No.10 Orm Street. They were of Irish extraction, arriving in Liverpool in the wake of the Great Famine in the 1840s. They must have all worked in that mill nearby. A hard life indeed. He used to rant when the Good Old Days musical hall programme came on. Said they were the bad old days.